Blog post 873 Hi guys, Here I have a huge portion of fresh Braganca news. Dream Job story continues, and today I am ready to report about three things all together: Revolutional squad changes during summer transfer window. Claimed season expectations. First results in season 2 with the new squad. Revolutionazing Squad revolution in the lower Portuguese League is a totally normal thing. 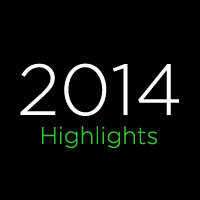 As we approach the new year, I've been reflecting and decided to write a post about my personal MyGamerXP highlights of 2014. This year I decided to attempt using twitter as a way of finding and interacting with other gamers. I'd tried the popular social network several times over the years, but never really understood it. I always felt it was a bit one-way in terms of conversation. There is a lot of crap on there! Numerous people splurging out random nonsense.However, one day something just... "clicked". It finally seemed to make sense and I have discovered what feels like a whole new world; filled with interesting, funny and knowledgeable gamers who's passion equals my own! Finally, somewhere I fit in! I can talk about games as much as I want and there is always someone out there with something interesting to say.This year I have found some really great people on Twitter. One particular highlight was on Halloween when someone from America sent me a HUGE box of various sweets and treats, all for free (refused to accept any form of payment). Such a kind gesture that was completely unexpected. I've received game codes, interacted with people who have made games I love, arranged online gaming sessions and much more. Twitter has been an enjoyable method of discovery and I'm finding great new people on there all the time! During the Summer, a site called Games You Loved were running a YouTube competition featuring various retro gaming prizes. I don't usually have much luck with competitions, but I thought "what have I got to lose?" and registered, thinking little else of it and certainly not expecting to win the top prize! To my amazement, (and quite predictably from the title of this piece) I won! I made a video documenting the event/prize which you can see here if you wish. I er... still need to work on my video and presentation skills. So I apologise in advance. I've never been to a gaming event before... ever! So this year I was surprised to receive invites to a few shows in the UK and Europe. Unfortunately due to several commitments and personal reasons, I was unable to make all of them. I did manage to attend Play Expo in Manchester though which was absolutely incredible!I got to play great retro classics (both on consoles and arcade units), meet with indie developers, try out the Nintendo Virtual Boy (for the first time ever), rack up loads of streetpass connections on my Nintendo 3DS and purchase some great collectables/games. I would love to attend more events in the future, so fingers crossed for 2015! This website has really evolved over this year. As some of you already know it started off as "GXP Blog", but in November I re-launched it as My Gamer XP. I've put a lot of time and effort into this site and as a result have had some amazing feedback and interactions with gamers around the world. It has allowed me to connect with people in a way that brings me joy each day.I have some exciting ideas for 2015 and beyond, and I'm really looking forward to the journey ahead.Do you have any great gaming or community highlights from this year? If so, let me know in the comments below! Back in October I stumbled across a shop of wonders; filled with soft colourful recreations of legendary gaming icons and references. These were all the work of Donna Evans, a talented young woman who is this month's featured gamer! I'm not really sure! I think investing in a brand new sewing machine when my other one sadly gave up the ghost was a good incentive to try some new and unique things. A better make and motor of machine meant that it could handle lots of different fabrics and layering of fabrics. 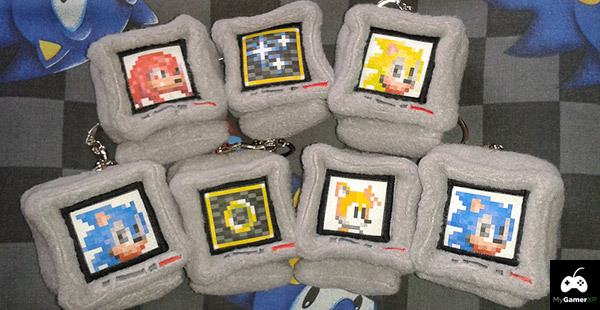 I attended SOS in 2011 and started making plush items back then. I've always loved gaming and making things that are a little bit outside the box. I've learned a lot since then though, and have (hopefully!) expanded my skill set somewhat in the manner I produce items. I am now quite experienced in appliqué, having read various tutorials online and discovering new processes myself. I use that as my main technique when making new things. 3. What would you say is the most difficult item you've produced? 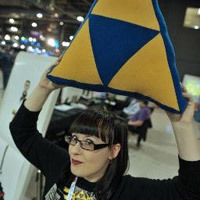 The biggest item would be without a doubt, my N64 controller pillow. It took a whole day to plan, design and print templates, appliqué, and fill. 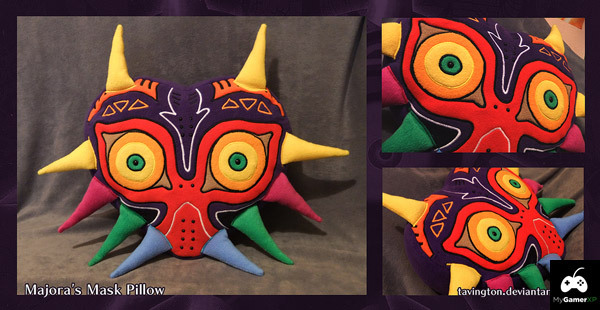 The most challenging item I've made to date is my glowing Majora's Mask pillow. A similar technique is used to the standard version I make, the only difference are the threads I sew with. They are prone to snapping, so it takes a lot longer for me to finish. The end result is pretty scary though! 4. One of the most visually striking objects on display was the Majora's Mask. How long does it take you to make one of those? Thank you! The Majora's Mask usually takes between 5-6 hours from start to finish, including pre-cutting all my shapes before hand, sewing on the sides and back, and filling at the end. 5. 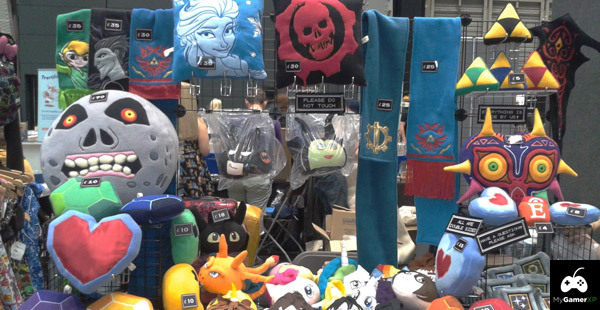 With all these wonderful things you've made, you're obviously a big gamer at heart! When did you first get into gaming? What was the first game/console you ever played? I got into gaming aged around 10-11, so pretty late for a child in the 90's. I saved up my own pocket money to purchase a SEGA Master System II and was the greatest thing I had ever bought.One of the first systems I ever played was the Mega Drive, though I was a little impatient to save up almost £120 back then to buy one! Oh this is difficult! But I'll give it a try! I love the variety of playing games with friends, like Smash, Streets of Rage or Mario Kart 64, but I also like solo play, for more intense games, that sometimes require certain skills or "thinking outside the box" such as Ace Attorney or Thief. I put New Leaf on there because it's really gotten my mum into gaming. I bought her a Nintendo 3DS for Christmas and she's played it every day since! It's nice to see her play a new game with me that she understands fully. It's something she hasn't done since I was small and it means a lot to me. Yes I have a few things! I mainly collect Zelda figurines but I have a few older pieces in there. My favourites that I own are my Toy Biz Zelda figures (yes I have the whole set) I got them dirt cheap from a small store a few years back, and I'm very surprised to see how much they are going for nowadays!I also own the gigantic First4Figures Ganondorf statue, (number 3, lucky me!) and the Link on Epona figure from Majora's Mask.I've never gotten rid of any of my games consoles either, I still have my Master System II, Mega Drive II and N64 all in their original boxes. The games consoles I grew up with are pretty special to me. 8. What sort of games do you most enjoy playing at the moment? Are there any you can't stop playing and are eagerly looking forward to playing? I'm quite taken with my 3DS at the moment as I carry it around a lot and play it at work. This year was a great year for Nintendo, with Layton vs Wright, Prof Layton Azran Legacy, Ace Attorney 5, Smash Bros and Pokémon.I still play New Leaf occasionally, but right now I'm playing Smash Bros. I've been picking up Thief again too lately, both new and old. I am fond of the classics. Oh gosh, that's a tough question! For an interesting look into his lifestyle, I would have to go with a rather obscure character - Garrett from the Thief series. I would be very intrigued to see how he lives his life, being a night owl and sneaking around peoples' houses for shiny treasures. Though having my eye plucked out wouldn't be something I would like to experience! I tend to have a few ideas on the go, but my next batch of items will veer away from video games for a little while, as I delve into food related plush pillows and items. My first items will imitate sushi, then hopefully onto western and British foods.Sometimes I plan a project depending on what materials I have left over from previous event preparations and commissions. I did start a Game Boy Color last year but never got around to finishing it. Now that I have more experience in this field, I would probably start it again from scratch. So here it is, our list of the top 10 best games for the Nintendo Wii U in 2014! If you've been good this year, you may want to add a couple of these to your Christmas list!